Il modo di pagamento di pagamento prima dell'arrivo: bonifico bancario, carte di credito (Visa, Mastercard). Jezero Apartments are located just 250 m from the southern shore of world famous Lake Bled in the charming village of Mlino. From the lake shore it is just a two minute walk to the heart of old Mlino village where the apartments are located. It feels worlds away from the hustle and bustle of the lake itself offering a peaceful and authentic alpine ambiance, a relaxed pace of life and beautiful old farmhouses. 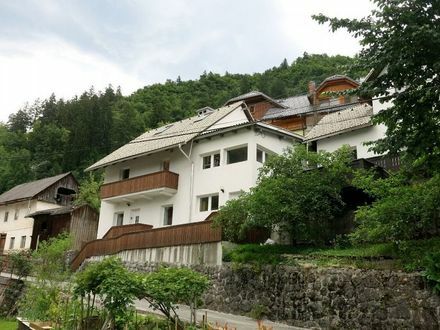 The house itself is on a hillside giving a nice feeling of space and great views of surrounding hills and forests above the Sava Bohinka river valley from all apartments and terraces. Mlino and Mountain View Apartments are on the upper level of the holiday rental accommodation, whilst the Studio and Riverside are on the lower level. Where the road meets the lake shore just 2 minutes walk away from the apartments there is a supermarket, several excellent restaurants, various points for swimming or catching a "pletna" boat to the island and start points for hiking up to one of the several hills offering stunning views over the Lake (including Straza hill where Bled adventure park / Summer sledging piste are located). The heart of Lake Bled town is a couple of minutes drive or 15 minutes walk away (1.3km), whilst to the most famous beach area at Zaka it is a lovely 2km walk around the lake shore. Don't forget to also explore the idyllic countryside and charming villages in the opposite direction from the Lake offering unforgettable views of the Karavanke mountains, the charming medieval Radovljica town 10km away and the beautiful Sava Bohinka and Sava Dolinka rivers both within a few kilometres southwards. There are an abundance of outdoor activities in the area including magnificent hiking and biking for all levels. Lake Bohinj is a 25 minute drive, Ljubljana just 45 minutes away and its airport even more accessible (30 mins drive). Whilst often overlooked as a ski destination, not only does Bled offer the excellent beginner pistes at Straza hill when snow conditions are right but is half an hour's drive from three of Slovenia's top resorts, Krvavec, Bohinj, Vogel & Kranjska Gora. Jezero apartments Bled, apartments Bled.